Temperatures have continued a downward trend since the warm weekend. Some spots could flirt with freezing Tuesday and Wednesday nights. Tranquil weather will last through Thursday. Today and Tonight: A seasonably chilly day is ahead. High temperatures will make it into the upper 50s, possibly snagging 60 degrees south of I-10. North winds of 5-10mph will make any additional warming difficult. Overnight will remain clear with our coldest temperatures of the week in the mid 30s. Some typical cool spots north of I-12 could flirt with freezing. Up Next: Clear skies and cool temperatures are expected through Thursday. Warming will then begin on Thursday afternoon, as cloud cover slowly increases ahead of an approaching storm system. An area of low pressure will develop the in western Gulf of Mexico on Friday sending a significant amount of moisture to the central Gulf Coast. 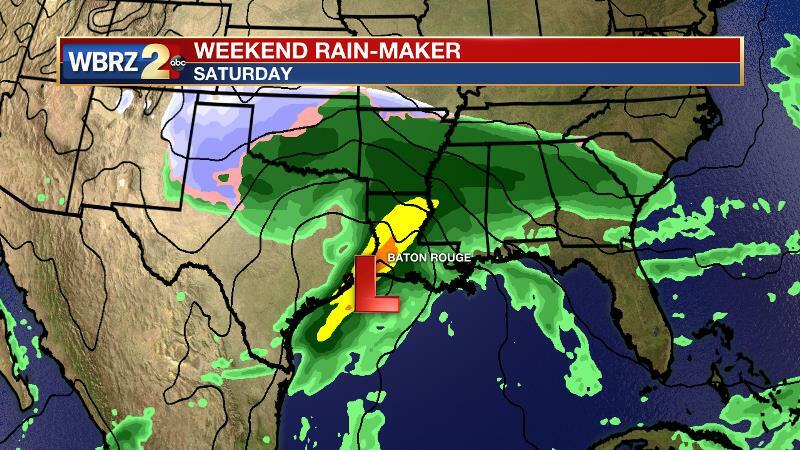 Two to three inches of rain could fall through Saturday night. High temperatures may briefly break into the 60s during this time, but dry and chilly conditions will return on Sunday behind a cold front. Expect temperatures of 10-15 degrees below normal through Thursday morning. High pressure will build into the south through midweek, moving across Louisiana on Wednesday. Tuesday and Wednesday nights will be the coldest with some isolated freezes possible in typical cool spots north of I-12. Forecast models are in good agreement regarding the next impact weather system expected to arrive at the end of the week. In summary, they depict a heavy rain threat, but do not indicate much chance for severe weather. An area of low pressure is expected to develop along the south Texas Coast in the climatologically favorable cyclogenesis zone. As surface high pressure sets up in the Southeast U.S. return flow will only strengthen as this low develops. In fact, as noted by the National Weather Service, moisture return through the atmosphere is expected to be significant enough to possibly set a new record for December 8th. The upper level pattern will allow ample space for this system to broaden and strengthen while the low level pattern will feature plenty of converging air generating the uplift for widespread heavy rain and thunderstorms. The Weather Prediction Center currently projects 1-2 inches for the local area, but this may need to be adjusted upward. Both the GFS and ECMWF models are closer to the 2-3 inches range.